Morocco’s up-and-coming Noor 1 CSP plant is a prime example. 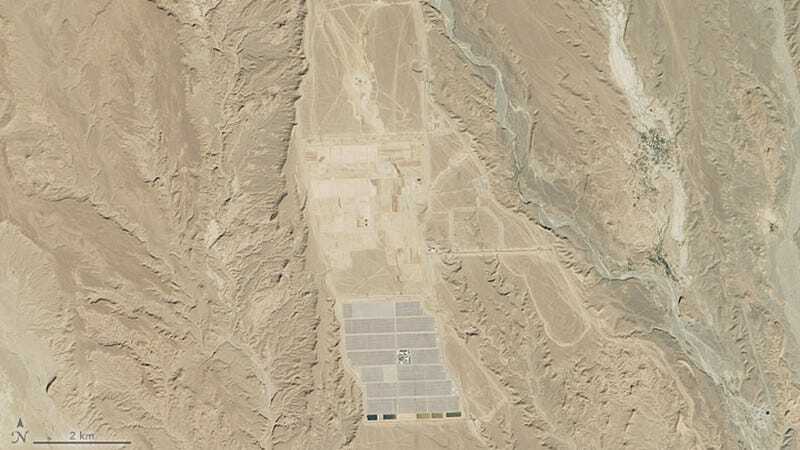 The first phase of this concentrated solar power plant, which is being built in the Sahara Desert near the town of Ouarzazate, is almost finished. Here’s how the area appeared in December 2013 when construction began. This image, taken on December 14, 2015, shows the plant in it’s current form. The plant is scheduled to be switched on later this year, at which time it will boast a power-generating capacity of 160 megawatts. Once the entire plant is built, it will be capable of producing 580 megawatts making it the largest solar concentrated solar power plant in the world. Once complete, it will cover an area of 2,500 hectares, or 6,178 acres. Concentrated solar power plants use the Sun’s energy to heat water and produce steam that spins energy-generating turbines. The system at Ouarzazate uses 12-meter-tall parabolic mirrors to focus energy onto a fluid-filled pipeline. The pipeline’s hot fluid—393 degrees Celsius (739 degrees Fahrenheit)—is the heat source used to warm the water and make steam. The plant doesn’t stop delivering energy at nighttime or when clouds obscure the sun; heat from the fluid can be stored in a tank of molten salts. The plant was originally intended to supply power to Europe via cables through the Strait of Gibraltar. But after several key European partners pulled out, the African Development Bank and the Moroccan government came to the rescue. The plant is now expected to meet internal Moroccan energy demands, which is expected to rise in the coming years. Email the author at george@gizmodo.com and follow him at @dvorsky. Top image by NASA Earth Observatory images by Jesse Allen, using Landsat data from the U.S. Geological Survey. Caption by Kathryn Hansen.